One typical time domain problem: With the carrier signal being high frequency and the signal transfer taking place in low frequency spectrum we are dealing with different time scales. Novel numerical proceedings are needed to both enable the transfer’s quality and to model the circuit. One already-well known technique to “split” the envelope from the modulation by the carrier is Equivalent Complex Baseband (ECB). But ECBs cannot be applied to nonlinear differential equations. Therefore, in ICESTARS multirate partial differential equations (MPDEs) are used to describe RF circuits featuring largely differing time scales. Such a multirate model is able to decouple the widely separated time scales of RF signals with the determination of multivariate solutions allowing the exact reconstruction of corresponding time-dependent signals. The simulation problem: On the one hand, the simulation interval must be in the order of the largest relevant time constant or vice versa reciprocally proportional to the lowest frequency of interest. On the other hand, the largest time step is restricted by the highest frequency of interest. According to Nyquist’s theorem the sample rate of the waveforms must be at least twice as high as the highest relevant frequency. Therefore in ICESTARS envelope simulation has been carried further by developing multirate methods based on wavelets dealing with widely separated time scales. Typical applications are circuits where a periodic carrier signal is modulated by a slower signal. The ICESTARS envelope simulation has been specifically designed to work even in the case of steep gradients due to digital-like signal structures. The envelope method based on embedding the system of ordinary DAEs into partial DAEs is the only technique with a sound mathematical basis. It exhibits a general mathematical framework that can be adapted to different classes of RF circuits. In ICESTARS it has been implemented in Infineon in-house simulator and LinzFrame and successfully verified for a large class of circuits, namely oscillators and mixers. Existing envelope techniques that were developed for simulating RF designs (i. e. circuits not involving signals with steep slopes) are limited regarding robustness and memory. ICESTARS develops new RF algorithms capable of efficiently simulating mixed analogue/digital circuits based on multirate partial differential equations (MPDEs). In circuit-envelope simulation, input waveforms are represented as RF carriers with modulation envelopes. Those modulation envelopes are described in the time domain. The input waveform consists of a carrier term and a time-varying term that describe the modulation applied to the carrier. Amplitude, phase, and frequency modulation or a combination of these can be applied. There‘s no requirement that the signal be described as a summation of sinusoids or steady state. It‘s therefore possible to represent digitally modulated (pseudo-random) input waveforms realistically. Circuit-envelope simulation permits the analysis of complex RF signals by employing a mixed time-frequency-domain approach. It samples the carrier‘s modulation envelope (amplitude and phase or I and Q) in the time domain. It then calculates the discrete spectrum of the carrier and its harmonics for each envelope time sample. 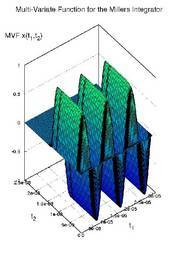 Like harmonic balance, it describes the nonlinear behavior of circuits and the harmonic content of the signals. Yet, circuit-envelope simulation also extends over time. It is not constrained to only describing steady-state behavior.